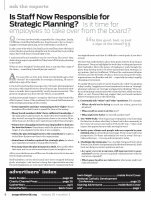 Home > Membership > Nonprofit World > Is Staff Now Responsible for Strategic Planning? Is Staff Now Responsible for Strategic Planning? Is it time for employees to take over from the board?